Simply Me: RELEASE DAY FOR Disney's Pixar INSIDE OUT!!! 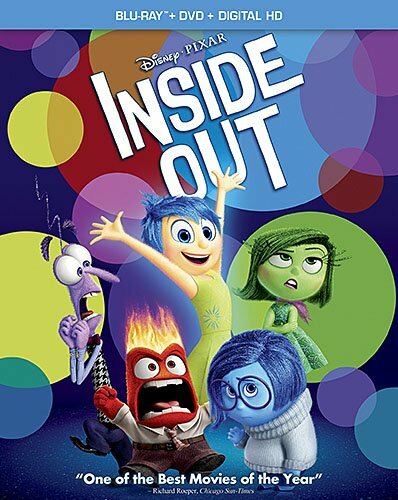 RELEASE DAY FOR Disney's Pixar INSIDE OUT!!! My boys and I so missed this movie when it was in theaters! We of course were down with some sort of sickness and never got to go see it! Poor little Quinn was heart broken he really REALLY wanted to see this movie and even tried to bargain with my sister to take him. Sadly we never got there, so it was with high anticipation we awaited the DVD/ Blu-Ray release date..
AND THAT DAY IS FINALLY HERE!! A sound as his mother that I adore. The characters are cute, EVEN ANGER!! When watching the movie you get to see Riley work through her emotions. Riley's family moves to a different home and this seems to triggers something inside of her. She seems to break a bit and shut down. It is up to the emotions to get back to headquarters and save the day. Joy works so hard all the time to try and make Riley feel happy and we start to see the toll it can take to always wear a happy face even when you are feeling something else. At the end of the movie I cried. I'm sure anyone who watched it will know why. The movie isn't at all sad, it is touching and very heart felt. I loved the journey through Riley's emotions and past. I love that the movie let you know it is okay for memories to be both sad and happy. That it is okay to let go of certain things. Don't miss this movie! As an adult or child this movie is a must see. I wasn't going to sit down and watch it with my boys, but I am so happy that I did. LAVA (Theatrical Short Film) - Inspired by the isolated beauty of tropical islands and the explosive allure of ocean volcanoes, LAVA is a musical love story that takes place over millions of years. Story of the Story - Director Pete Docter talks about the evolution of Inside Out, from the ideas and memories that inspired the story through the hurdles, explorations and experiences that helped shape it into the film it is today. Mapping the Mind - Inside Out's artists take you through the years-long process of designing and creating a world everyone knows, but no one has ever seen - the human mind. Our Dads, the Filmmakers - Elie Docter (daughter of director, Pete Docter) and Grace Giacchino (daughter of composer, Michael Giacchino) bring you behind the scenes for aninside look at the making of the film. Into the Unknown: The Sound of Inside Out -What is the sound of a memory forming? Sound designer Ren Klyce describes the challenges - and the unique solutions - involved in creating the aural world of Inside Out. The Misunderstood Art of Animation Film Editing - Learn more about the crucial role of an animation film editor, who helps take the story from its earliest, most exploratory versions, to the final, polished film you see onscreen. Riley Grows Up - In this scene from a version of the film where the primary relationship was between Joy and Fear (then named Freddie), the emotions begin to notice a change in Riley. Joy's Decline - Joy's struggles to make sense of the limitations on Riley's behavior that seem to be springing up at every turn. Misdirection -Joy and Freddie encounter a group of Riley's "retired" imaginary friends, including an early version of Big Bong. Construction - Joy is guided through Riley's mind by a radical non-conformist, Bing Bong, outraged by the demolition of older areas like Imagination Park. Commentary - Commentary includes participation from directors Pete Docter and Ronnie del Carmen, and producer Jonas Rivera. Inside Out Trailers - A collection of domestic and international trailers made for Inside Out. Very seldom do I watch bonus material. This was just one of those movies though I couldn't get enough of and I wanted to soak up as much as possible. The bonus content on the DVD/ Blu-Ray is incredible! You get a real in-dept look at the making of the movie, how the decided what to use. I love that we get to see the people behind the movie. Overall this movie is a hit! One of Pixar's greatest films and I have a feeling people are going to be talking about it for a very long time.